If you enjoy stories of strong women, like the White Queen, on TV at the moment, you might want to pick up a copy of My Notorious Life by Madame X, a novel based on a true story by Kate Manning. It would be a great book to take on holiday, easy reading and great story-telling. 'In the end, they celebrated. They bragged. They got me finally, was their feeling. They said I would take my secrets to the grave. Axie Muldoon, the headstrong daughter of Irish immigrants, forced to beg for pennies as a child on the brutal streets on New York City, grows up to become the most successful – and controversial – midwife of her time. ‘Saved’ from poverty by a well-meaning philanthropist, Axie is sent West with her younger brother and sister. But the kindness of strangers is short-lived and soon Axie returns to the city of her birth, alone, but determined to one day reunite her family. When she is taken in by a Manhattan doctor Axie learns the craft that she will live by – and later fight for. She rises from the gutter to the glitter of Fifth Avenue high society, and discovers that the right way is not always the way of the church or the law, and that you should never trust a man who says ‘trust me.’ But what if that man is an irresistible risk-taker with a poetical Irish soul? As Axie’s reputation grows she finds herself on a collision course with the crusading official who would be the righteous instrument of her downfall. It will take all of her power to outwit him and save both herself and those she loves from ruin. A former documentary television producer (and winner of two Emmy Awards and an Edward R. Murrow Award), Kate Manning has written for the New York Times, the Los Angeles Times Book Review, Glamour and More, among other publications. She is the author of Whitegirl, a novel, and is an adjunct faculty member of the English Department at Bard High School Early College. She lives with her family in New York City. I thoroughly enjoyed this book, the characters are well drawn, lively and appealing. The story is told by Axie Muldoon and lapses into the vernacular just enough to remind you of her lowly roots. There are no heros or heroines in this story just desperate people trying to make their way in a rich MAN's world. It is very much a man's world and reminded me just how fortunate I am to have been born where and when I was. In Axie's time both rich and poor women suffered from medical ignorance and moral posturing. Today it is mainly poor women who still suffer but unfortunately there are still many societies where matters of conception are still hugely contraversial and, of course, it is women who suffer. If you enjoy a good story of a feisty young girl and her family, fighting fate, at first to survive and then to make something of themselves, you will enjoy this novel. It's a family story full of love and compassion without being soppy, it's a tragedy, a social history and an entertainment. 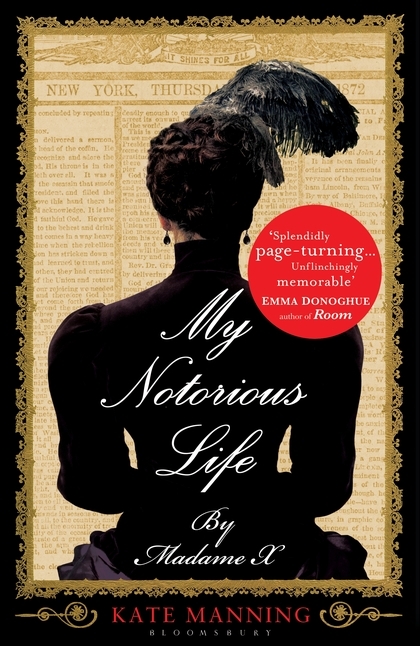 My Notorious Life by Madame X will hook you in and keep you reading until you discover just how Axie survives her trials and outwits her enemies. Many thanks to Jude for providing this copy for me to review, I was not paid for this review and my views are my own. Jam, Jam, Jam, Jam - and a Giveaway!